Congratulations to the distinguished Elijah Watt Sells Award winners. The Belk College of Business is proud to congratulate the accomplishments of Master of Accountancy alumni, Katie Warlick '17 and Wesley Sweigart '16, '17 on receiving the Elijah Watt Sells Award. The American Institute of CPAS (AICPA) announced that the award was bestowed upon 58 CPA candidates who obtained a cumulative average score above 95.50 across all four sections of the CPA Examination, passed all four sections of the examination on their first attempt and completed testing in 2017. “We are incredibly proud of Katie and Wesley on their truly impressive accomplishment within the accounting industry,” said Dr. Jack Cathey, MACC Program Director and Associate Professor of Accounting. “These two alumni not only thrived in the Belk College of Business MACC program, but are shining examples of passing with distinction. 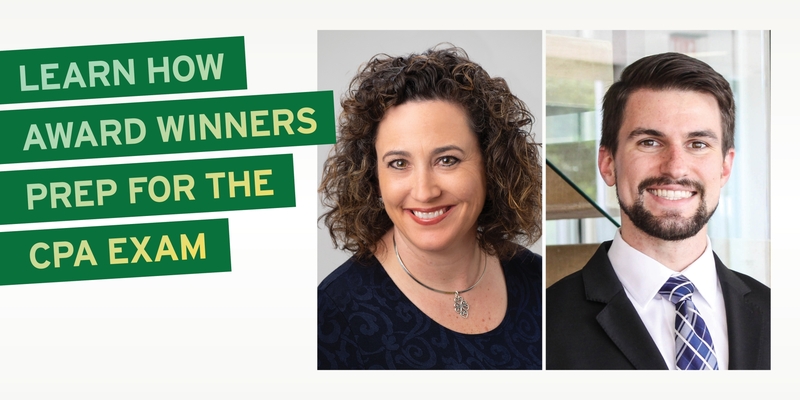 Katie and Wesley did not just test in the top 1%, but instead the top .06%.” According to the AICPA, 95,858 individuals sat for the examination, with 58 candidates meeting the criteria to receive the Elijah Watt Sells Award. Katie: I am a Tax Associate at CliftonLarsonAllen in Charlotte. Wesley: My first job after completing the MACC program was with my current firm, RSM US LLP. I am now an Assurance Associate in the Charlotte office. Did you always know that you wanted to pursue your MACC? Katie: Not at all. My undergraduate degree is in Journalism, so I always assumed writing would be the main focus of my career. After my son was born, I decided to focus on my family and became a stay at home mom for 14 years. As my kids got older and more independent, I began to think about what I wanted to do with the next chapter and kept coming back to accounting. I already had an MBA, so I didn’t think I needed to earn another master’s degree. While I was researching how best to pursue an accounting degree, I had the opportunity to talk to Dr. Cathey about the MACC program at UNC Charlotte. That one phone call was all it took to change my mind and apply for the MACC program. Wesley: I actually didn't decide I wanted to pursue a career in accounting until my sophomore year at UNC Charlotte. Even then, I didn't recognize the value of a CPA and MACC immediately. Through conversations with personal connections and university faculty, I decided that the most advantageous career path would be in public accounting. At that point, a MACC and CPA accreditation became imperative. I am glad I decided to pursue my MACC at UNC Charlotte, because the knowledge I acquired helped me to pass the CPA exam and has benefited my career as well. Why did you choose the Belk College of Business? Katie: When I first moved to Charlotte, I had the opportunity to take a couple of courses in the Belk College MBA program and had a great experience. When I decided that I wanted to become a CPA, UNC Charlotte was at the top of my list of schools to help me prepare. Wesley: I chose UNC Charlotte because of its proximity to the city of Charlotte and because the Belk College of Business is growing in recognition as a business school. When I chose business as a major, I knew that it would be advantageous to be near a major business hub, and Charlotte is exactly that. Name recognition was also important to me, and the Belk College of Business is becoming a recognized name in the field of business through the achievements of alumni such as Carol Lowe and Robert Niblock. Also, I grew up in Charlotte, so I enjoyed the familiarity and proximity to family and friends. How did you prepare for the CPA exam? Katie: I set up a study space in my basement with lots of inspirational photos and quotes on my desk, including a picture of my great-grandmother at her college graduation. I also set up a Himalayan salt lamp, which is supposed to help with focus and concentration. I used the Becker CPA review program and followed it religiously. There was no way I wanted to have to take a section a second time. While I was preparing for the exam, the world was obsessed with April the giraffe and her pregnancy. Most of my study breaks involved watching April stroll around her pen munching on hay. It made for a nice change from Tim Geraty’s video lectures. Wesley: I prepared for the CPA exam by attending every review session offered by UNC Charlotte, as a part of Becker's live CPA Exam prep course. These lessons, taught by UNC Charlotte faculty, coupled with Becker CPA exam prep materials, set me up for success on the exam. When did you realize that passing the rigorous CPA exam, with such distinction, was in your future? Katie: I’m a very competitive person, so as soon as I heard about the award, I hoped that I wouldn’t score well enough on my first exam to make it a possibility. I was afraid that I would put too much pressure on myself and burn out before I finished all four sections. I received my first exam score quickly and realized that the Sells Award was a possibility. Fortunately for me, I took the exam in the first cycle of the new, more simulation-heavy version. This meant that my next scores took a long time to be released while the AICPA ensured that the revised scoring system was valid. I actually took all three remaining sections of the exam before I got another score. I received my second and third scores in August within about a week of each other, and started to get excited. My last score arrived in September, and I was thrilled to know that not only had I passed, but that I thought my scores qualified for me for the Sells Award. It was hard keeping that information to myself until May when I was notified by the AICPA and June when the official press release went out. Wesley: I was aware of the Elijah Watt Sells Award prior to beginning study for the CPA exam. When I researched the amount of study that would likely be required to achieve a 95.5% or higher average on the exam, I decided that obtaining the award was not realistic for me. Only after I received my score for the AUD section of the exam - a 99, which is a "perfect" score on the exam - did I realize that it was a possibility. I had to pinch myself when I received the score, as I would have been happy simply to have passed. A short time later, I received a 98 on FAR, which many people believe to be the most difficult section, and I realized that I needed only to continue with the same strategy in order to receive the award. What has been the most rewarding part of winning such a prestigious award? Katie: I am thrilled to bring such positive attention to the MACC program. I had so many great professors who challenged and encouraged me throughout my time in the program. It’s great to be able to give a little something back. Wesley: The opportunities that have arisen through the award to promote the University and my firm, and the connections therewith, have been amazing. It has been such an honor to be named with these organizations since they have given me so much. On behalf of the Belk College of Business, congratulations to the distinguished Elijah Watt Sells Award winners, Katie Warlick and Wesley Sweigart!